Begin by building saved segments. These are dynamic searches that run constantly, delivering regular alerts and updates with new information from your alumni and constituents. Segments help the team stay on top of relevant information, collaborate with each other, and get the most out of your EverTrue partnership. 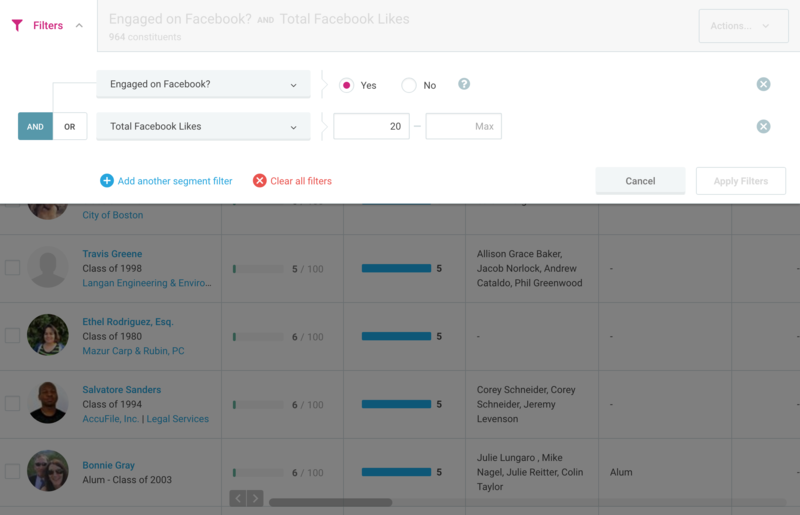 Each user can build segments for their own use or share with teammates for full visibility into your group’s efforts. Here are a few segments we recommend building right away. As you do, you’ll find more you’ll want to build and save along the way. Get to know your most-engaged alumni on Facebook. This segment helps you identify alumni who LOVE your institution. You can ask this cohort to become regional volunteers, social ambassadors, or career mentors. This is also a great segment to share with your fundraising team, as these highly engaged graduates are the most likely to become donors. Create a segment that tracks constituents who have either reacted to five or most posts or commented on a post within the past year. Leading institutions use this as a baseline measurement to track alumni who are engaged digitally with their alma mater. 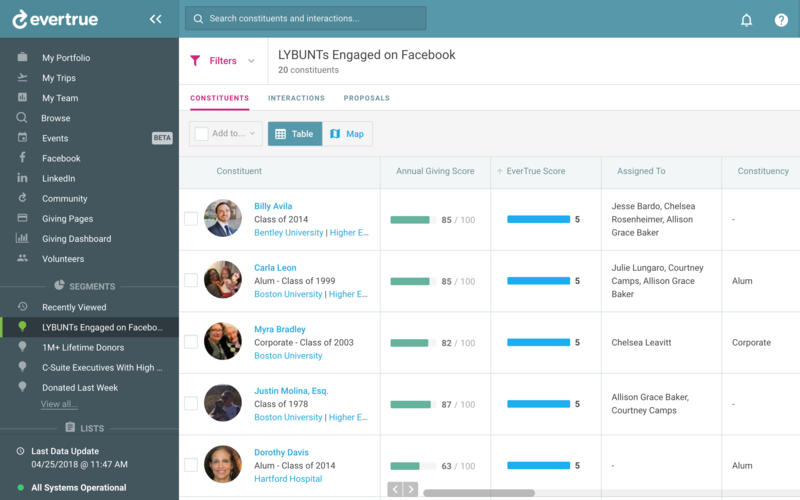 See how Cornell University tracks alumni engagement with EverTrue and uses that information to connect graduates’ interests with opportunities to give, volunteer, or attend events. You can use EverTrue’s unique partnership with LinkedIn to receive notification when alumni move to a new city or state. 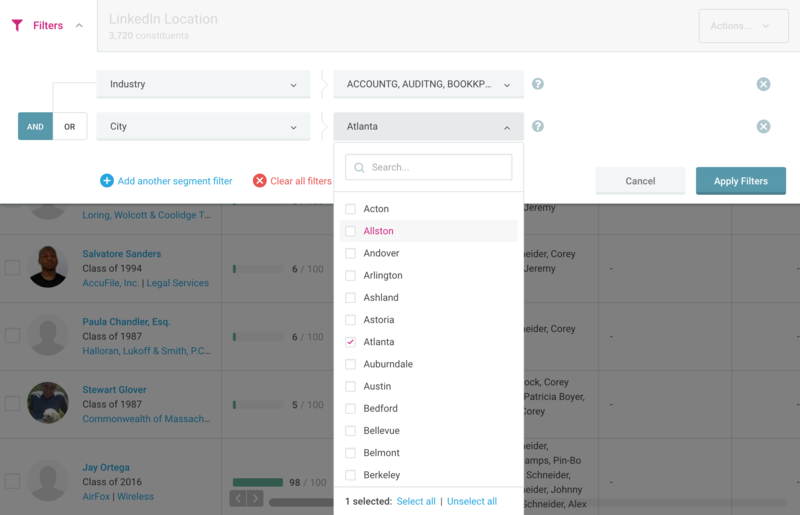 Set up searches based on LinkedIn Location for key regions or important cities and save them as segments. You’ll receive updates as alumni move and update their LinkedIn profiles to reflect their new hometown. This helps you easily find alums that have moved but didn’t self-report their new information to the school. Welcome them to the new city, help them get plugged in to a local alumni association chapter, or invite them to the next regional event. Bonus tip: Expand your invite list by running and exporting this segment before sending invitations to every regional event. Use EverTrue to discover which alumni have interacted with your Facebook pages in the last month. This helps you discover what content most interests them, which gives you a feel for the pulse of your alumni community, information for one-on-one meetings, will help you plan relevant events, and measure results on communication efforts. You can use this information to know who to prioritize for one-on-one meetings when you’re traveling and see tangible results from your communications outreach. Bonus: Layer in LinkedIn Location to this segment to help plan your next alumni event by inviting your most-engaged alumni. Try building region-based segments of alumni in important industries. 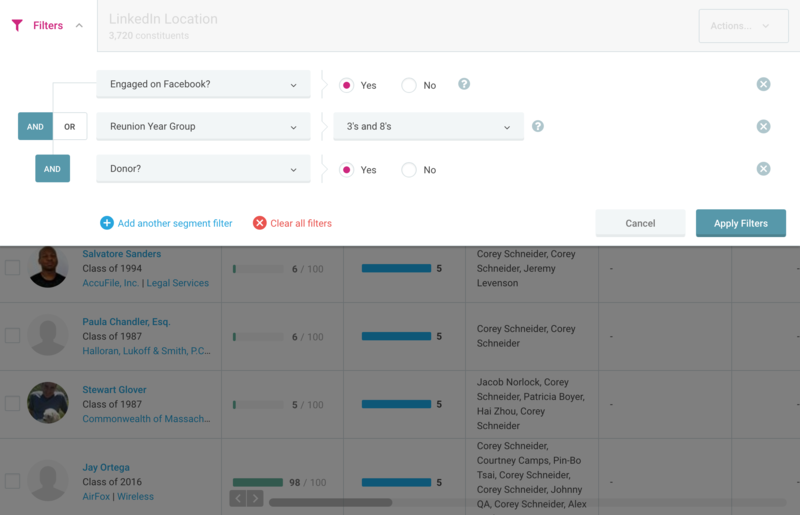 Not only will you receive notifications when graduates self-identify as moving into that field or city, but these segments help you plan networking events by giving you an up-to-date list of potential invitees to events in key regions. Need to enlist help for reunion planning efforts or maximize reunion year giving? With this segment, you’ll regularly know which alumni are in a reunion year and engaging on Facebook, then you can track their giving status. 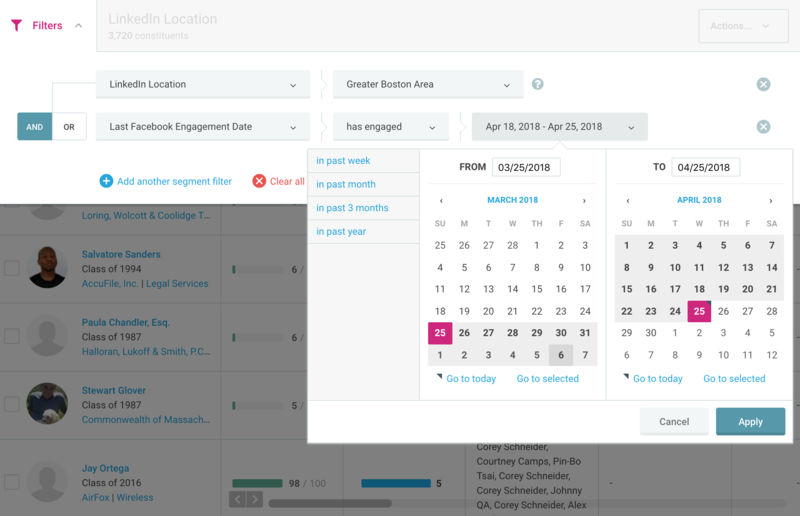 This helps you track reunion volunteers and committee participation, feed prospect lists to your annual giving team, and connect with alumni in a year where you know your institution is top-of-mind. 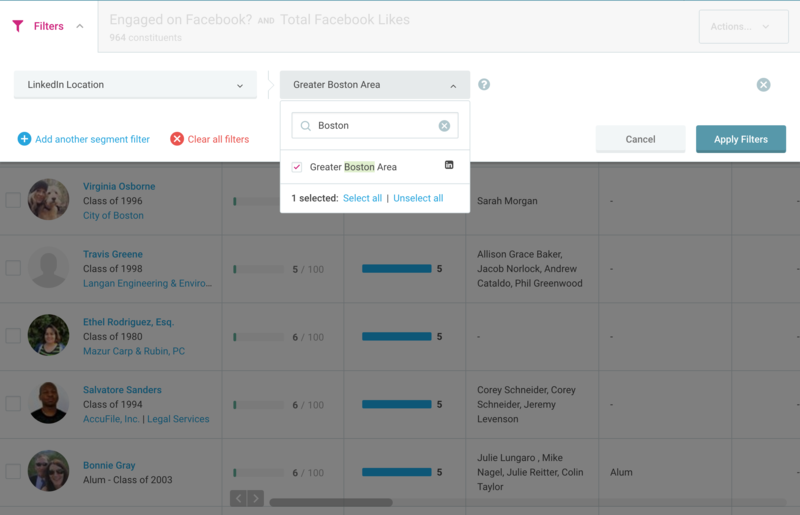 You can share every list or segment you build with other EverTrue users at your institution. And you can even send notes to other team members right from EverTrue. No more outdated spreadsheets or Word docs! Now every list you’re working on contains updated alumni information everywhere you need it: on your desktop, tablet, or smartphone.